"Do you really want to go back to your boss and tell him that you don't have Stanley Kubrick and you don't have the money?" 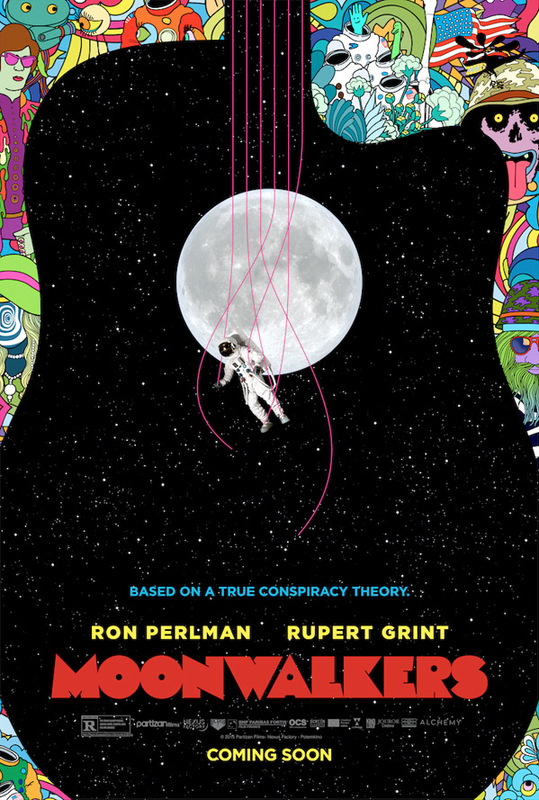 Alchemy has released the first trailer for Antoine Bardou-Jacquet's Moonwalkers, a comedy about a CIA agent and a rock manager who team up and try to find Stanley Kubrick in order to fake the moon landings. I initially labeled this as an alternate history, but realized it's actually more of a funky comedy about what could've been happening down on Earth while the real moon landing was taking place. Ron Perlman and Rupert Grint star, with Robert Sheehan. There's a really fresh, original, very 60s vibe to this that makes it much more interesting than most of the comedies we see these days. Enjoy it. What if Apollo 11 never actually made it? What if, in reality, Stanley Kubrick secretly shot the famous images of the moon landing in a studio, working for the US administration? This is the premise of a totally plausible conspiracy theory that takes us to swinging sixties London, where a stubborn CIA agent will never find Kubrick but instead is forced to team up with a lousy manager of a seedy rock band to develop the biggest con of all time, in this riotous, high-tempo action-comedy. Moonwalkers is directed by first-time filmmaker Antoine Bardou-Jacquet, from a screenplay by Dean Craig (Dirty Little Secrets, Death at a Funeral, A Few Best Men). The film first premiered at the SXSW Film Festival earlier this year. Alchemy will release Moonwalkers in select theaters + VOD starting January 15th, 2016 next year. Cool? Alternate-History! I wish it was focused on another what-if, but it still looks pretty good. I like Perlman and it is great to see Grint working on something (anything, really). // Dig the poster as well. This looks good. And I'm glad Rupert Grint is doing something. Honestly, I consider him to be the only one worth mentioning in that harry-potter trio. The trailer is so enjoyable I watched it 4 times. Oh that movie's gonna be fun. That Poster is super good. Looks a funny movie too.